I adore this cover so much! I really like the addition of the recap page being barely visible. Still working off my Father’s Day present my wife got for me from Mile High Comics. This is the only Legacy issue that I bought from that purchase. I do own issues 270 and 271, so one day, I will finish this storyline. This issue takes place between either issues 5/6 of Avengers vs X-men or 7/8, there is no handy footnote nor checklist in the issue itself. The final image of this post shows the details better but I noticed this on one of my rereads of the issue. There are two fun costume decisions that were made for this issue. I’m not sure if Baldeon gets the credit or if it was already determined when he got there. The first one is something that hopefully got attention at the time. Rogue’s shirt can be zipped all the way up to their throat. That’s pretty impressive as that isn’t how most of her shirts fit her. The second is that she has the same style of boots as Magik does. There must have been a sale or something! As much as I like Rogue’s look at this time, that does seem to be a lot of Xs. Is it a good idea to have an X right on your chest? It seems too much like a perfect bullseye. At the time, Rogue only had her absorption power, and whichever power she obtained at the time. So she isn’t nigh-invulnerable like she spent most of her superhero career. Then she has Xs on her shoulder pads and on her belt. I also like her scarf. Inside front cover is for that Amazing Spider-Man game that I still want to play. China. 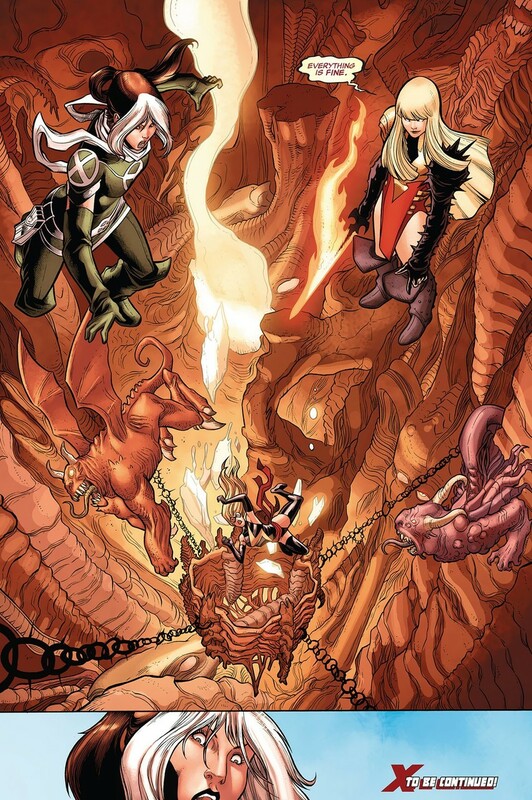 This is during the time when Magik has one fifth of the Phoenix Force. Which was such an awesome moment! She is looking over Iceman and Rogue’s progress. I like the attention to detail to the Phoenix Five’s global plan. One can’t just quickly change the agriculture as it will just collapse under itself. So using Iceman’s ice powers, the ice will gradually melt and not be a shock to the landscape’s system. A very clever plan. I really do like Baldeon’s art here and Reber’s coloring makes the comic soar as well. Rogue is happy that the X-Men, together, are making these world changes. I really like Magik in this issue. Sure the Phoenix brought out some of her inner demons and dark side but she is amazingly blunt and honest. She was confident before but now she has a cosmic fire bird on her side. Her comment about how the X-Men could accomplish more once they are no longer being hunted is spot on. I like Magik making sure Rogue is doing okay. Thanks to her powers, they can essentially have the same X-Man in two places but Magik worries that it may be taxing Rogue. Rogue can handle it. You Can tell that those are the same boots there, with that extra flap material at the top. Iceman calling Magik, boss, makes me smile. She makes a big point about how she isn’t his boss but they are all united and equal. Though, if she was being brutally honest, she is his superior in almost every way. But she does make the point that she has had to tell him a hundred times to stop calling her, boss. So I imagine it does get old after a while. But that’s Iceman for you. 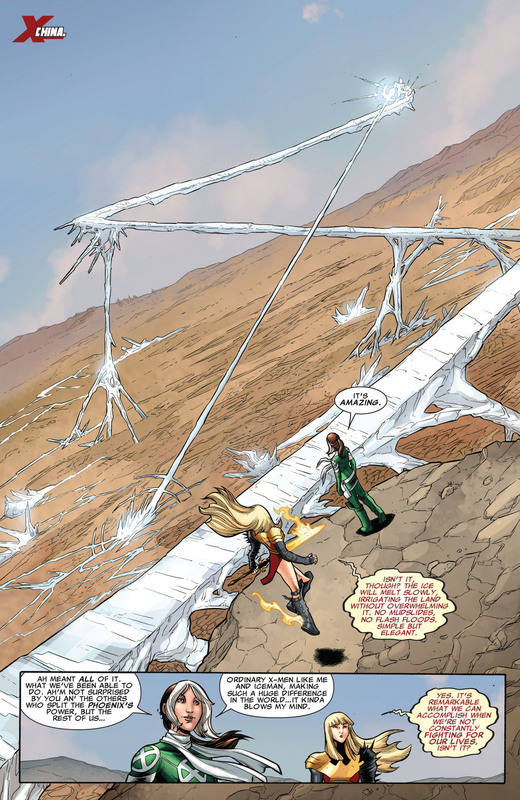 Rogue is on her way to New Orleans and borrows some of Iceman’s powers. He’s far too happy to help as Mardis Gras saved him during his students days, when he was hoping to be an accountant when he grew older. Then there are a bunch of pages until Magik shows up again. I like that Rogue is greeted kindly by soldiers. She just froze the large lake that was causing the issue. One of them recognizes a Mississippi accent and she tells him she is from Caldecott County. The solider likes having a local hero helping out even more. So much so, in fact, that he offers her the rest of his catfish lunch. Which is pretty awesome of him to offer and for her to accept. I adore the page of her just eating the catfish. She really likes it, plus, it must be nice to just relax for once. It doesn’t last long as that same solider, now that he has done something nice for her, informs her that there is a distress call. Rogue agrees to investigate and creates an ice slide and gets out of there. 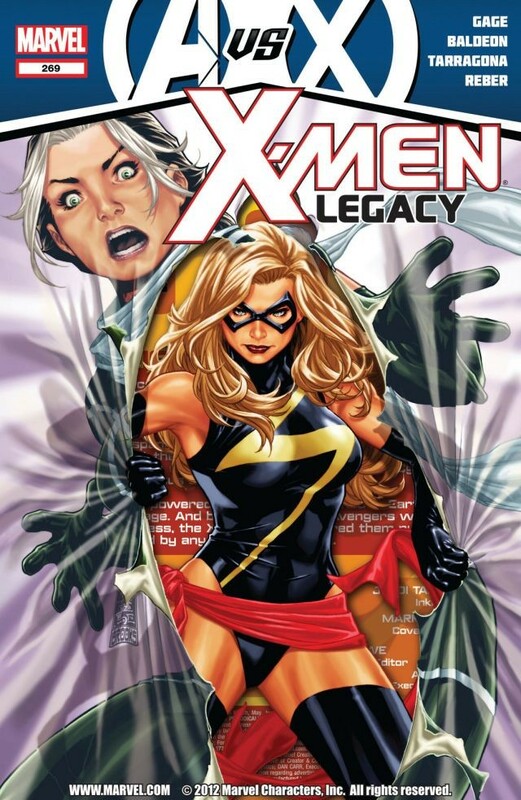 Turns out it is a flatscan dirty trick and Carol Danvers, as Ms. Marvel, is there to talk to Rogue. Of course, if you once stole a person’s memories and powers, you don’t really anticipate that person just showing up to talk and Rogue punches her in the mouth. To the mouth? I’m not sure. What follows is a pretty awesome sequence of the two women, with so much baggage, just talking. Sure, they are fighting as well but that’s just because Rogue didn’t listen to Carol at first. 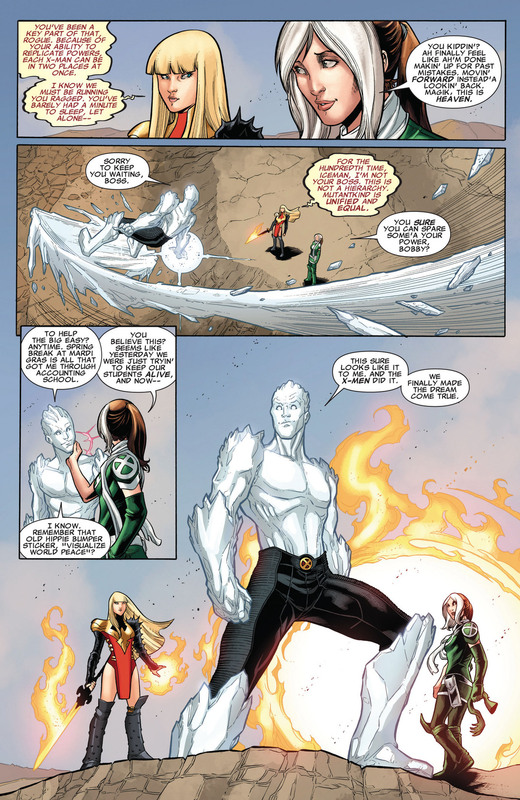 Rogue realizes that she is no match against Carol as Iceman’s powers are not so good – or at least, she isn’t experience with them. She gets the idea, as horrible as it is, to just take Carol’s powers – which is pretty mess up. Carol loses her mind for a moment, and starts shouting, how could you do that to me? Which she is completely in the right about. Rogue ruin both of their lives with that and that must have brought so many memories (or lack of memories) to poor Carol. Now that she is Captain Marvel, but not at this point in publication, I feel weird typing Ms. Marvel. I prefer Warbird but she, herself, has distance herself from that codename. It isn’t until Carol starts using her energy blasts from her hands that I have the thought of why didn’t Rogue get that power? Did Carol only get that power once she was made into Binary by the Brood? My only real experience with her is with her time in Busiek’s awesome Avengers run and then reading the back issue appearances of her time with the X-Men – which was also spectacular. That must be the reason. I just so associate Carol with hand blasting that I never thought about why Rogue didn’t get that power. That must be the reason though, its post-Binary. Ooof, Carol has had a few codenames over the years. People don’t seem to make fun of her for it like they do Kitty Pryde. There is this great exchange when Rogue mentions that the X-Men have done more for the world’s actual good than the Avengers have ever even tried. Carol rebuts this with how the changes are too fast and too sudden, they have not been earned. Reminds me of Captain America and Superman’s exchanges in JLAvengers – where Cap thought Superman and his universe, did too much for humanity, whereas Captain America thought that the heroes place was just protecting it from harm. Carol makes a reference to the incredible, It’s a Good Life, episode of Twilight Zone. Which has a decent sequel in “It’s Still a Good Life” when they brought the Twilight Zone back in 2003. 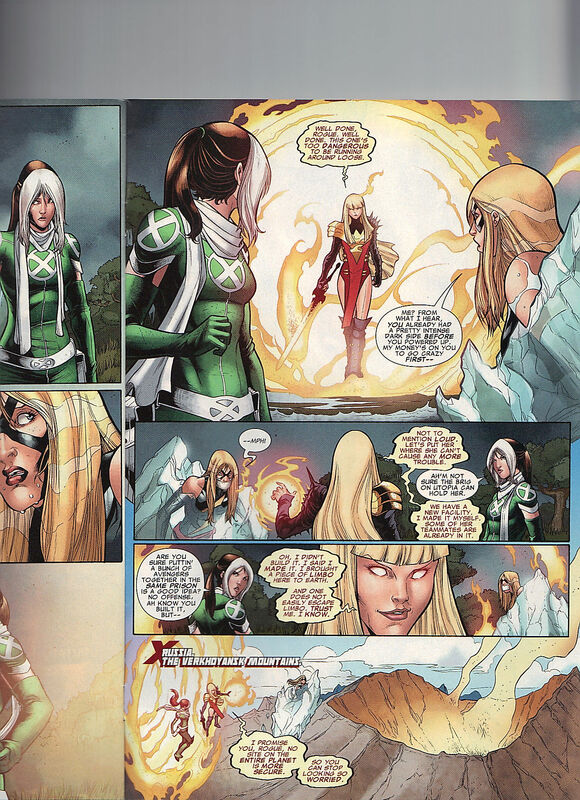 Rogue states that if the Phoenix Five go bad, the X-Men will stop them, which is exactly what they try to do in AvX 11. The fight ends when Rogue throws Carol into a body of water and keeps freezing it as Carol tries to break free of it. Once she does, she’s exhausted. Then they get a visitor. Magik has arrived to take Carol as their newest prisoner. Carol comments on how Magik had a dark soul prior to becoming all powerful. As if flattery would get her far. Carol states that Illyana is her choice for going crazy first (she isn’t). With this, Illyana slaps tape over Carol’s mouth to silence her. Rogue starts asking if it is a good idea to put all of the Avengers into one prison. The X-Brig won’t be able to house too many Avengers. Magik tells her that she has made a prison that will hold anyone. Rogue starts to question how she could build a prison when Magik cuts her off. Illyana moved a piece of Limbo into this realm and that is what they are using as a prison. Limbo on Earth sounds scary. Illyana makes a chilling reference to how Limbo isn’t easy to escape, which is such a sad reminder of Magik’s origins. Verkhoyansk Mountains, Russia. I adore Magik’s line, of her trying to assure Rogue that she shouldn’t look so worried, the prison is quite secured. It took me until my second read through to realize that Rogue’s worried expression comes from having a piece of Limbo in the Russian Mountain side. Like, this is how far the Phoenix Five are willing to go to not be stopped. If only that was as far as they were willing to go as Namor will later prove, they are willing to go much farther. See from that angle how much Rogue and Magik’s boots are the same? Look how frightening Carol’s new prison cell is! No wonder Rogue will spend the next issue or so trying to bust Carol out of there. We’ll get to those eventually.